The Run with the Wolves 5K attracted over 400 participants in July 2014. Registration is now open for this year’s event. Indiana University East’s Run with the Wolves 5K Run/Walk is Saturday, July 25. Registration is now open. Runners and walkers will join more than 400 other participants for this year’s event on the IU East campus and run the Red Wolves’ cross country course, located behind Hayes Hall. The event includes a free “Run with Rufus” 1K family run/walk. All pre-registrants receive a Run with the Wolves tech shirt. Day-of-race registration opens at 7 a.m. on July 25 on the Hayes Hall patio, located on the lower level of the building. The 5K run/walk starts at 8 a.m. followed by the “Run with Rufus” at 9:05 a.m. Awards will be presented at 9:25 a.m. at the Hayes Hall patio. 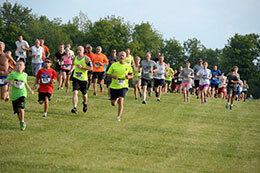 Run with the Wolves is part of the Wayne County Challenge series. Register online at iue.edu/5K. The pre-registration cost is $20, and day-of registration is $25. Students in grades K-12 and college can pre-register for $15 or register on race day for $20. Proceeds from the event will support student scholarship programs of the IU East Alumni Association. For more information, contact Terry Wiesehan, director of Alumni Relations and Campus Events, at (765) 973-8221 or email twiesaha@iue.edu.